Teaching your dog to walk nicely on leash is one of the best things you can do for their quality of life. It’s highly unlikely that you’re going to walk your dog if they’re pulling you all over town. If your walks are enjoyable for you, then you’ll be more likely to take your dog out for a walk, right? 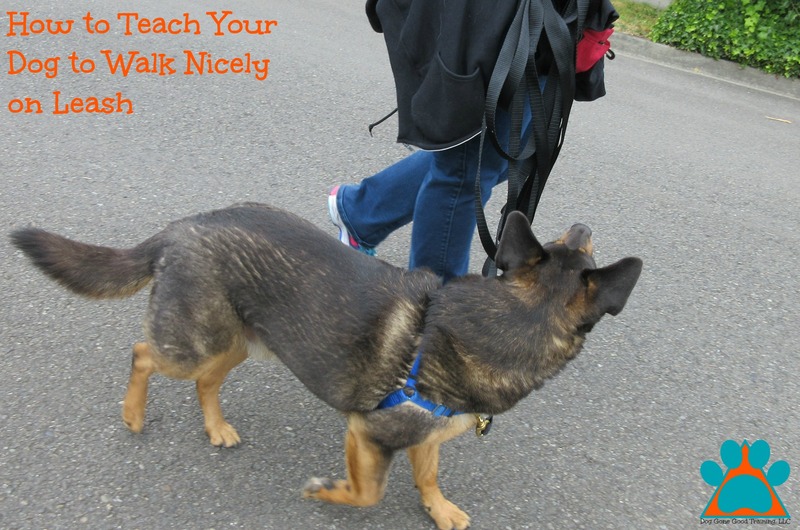 This article will focus on one of my favorite ways for teaching polite leash manners to your dog. Anything that gets rewarded happens more often. In the case of walking on leash, reward your dog when he is walking nicely next to you. It doesn’t have to be a formal heel, but the leash should be loose and comfortable for you to hold. Today’s focus will be the technique called “Choose to heel.” In this technique, the dog is either on a long leash or off leash. Please be sure that you’re practicing this technique in a safe environment without other dogs around. You’ll want to start in the lowest distraction area as possible. This is likely going to be your living room or your own backyard. As your dog begins to understand what is expected, then you can move to more challenging and distracting environments. Today’s demo dog is going to be my rescue mix, Bandit. We’ve known each other for years and he has a 100% reliable recall. He is also highly food motivated and couldn’t possibly ever get enough attention from humans. I took him out on an overcast day where storms were in the forecast which meant that it was highly unlikely that other people would be out walking their dogs. With all these factors combined, I was comfortable using the “choose to heel” technique. Please be sure to weigh all factors when you’re picking what training scenarios you set up for your dog. I have Bandit on a 30-foot long leash. It is not a retractable leash; it’s a regular nylon leash. (Retractable leashes can and do teach your dogs to pull on leash which is the exact opposite of what we want.) If Bandit wanted to be further away from me, I gave him more leash. In this picture, you can see that he’s a good 10 feet ahead of me. I released more leash as he needed it. I was using my voice and his good recall to keep him out of the road, but in general, he does know to stay on the sidewalks. Happy, relaxed, and overjoyed to be around you. If you’d like your walks to be more enjoyable for both you and your dog, sign up for a training session here in my online shop. Have a wonderful day! Bandit’s doing a lovely job, he looks happy! I still have trouble with my chi-mix Matilda sometimes, but it’s mostly because I’m not clear on what I want her to do. She loves to mark every tree, so I feel conflicted about allowing her to enjoy the walk in her own way, but I don’t like it when she pulls to get to the next post!